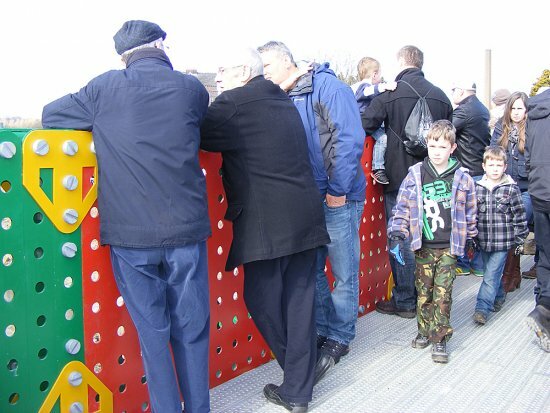 “We all have to grow old, but we don’t have to grow up!” These were a few of the memorable words spoken by the Lord Mayor of Bolton, Guy Harkin, as he officially opened the full-size “Meccano” bridge at 11:30 on the bright but cold morning of Saturday 6th April 2013. 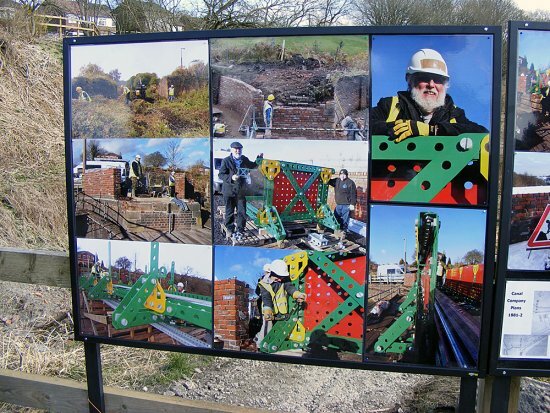 Situated at a historic former canal junction at Little Lever, Bolton, the structural components of the footbridge are composed entirely of Meccano-style parts, upscaled ten times. 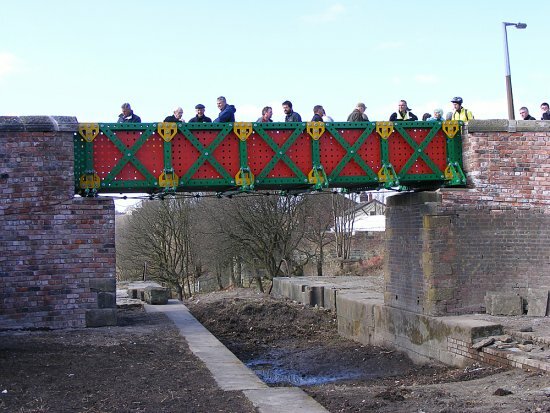 Commissioned by Bolton Council and built by the Manchester Bolton & Bury Canal Society, the bridge cost £90,000 and was designed by prominent local artist Liam Curtin, who was also present at the opening ceremony. 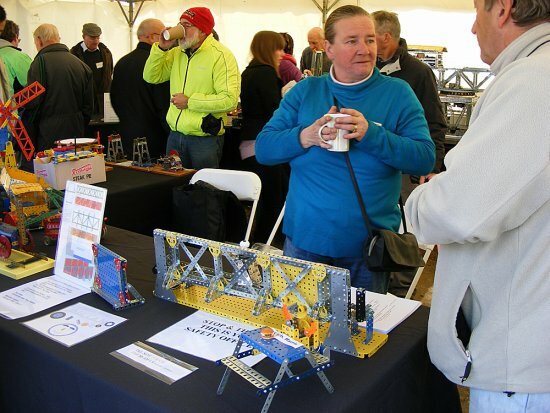 In anticipation of the event the North West Meccano Guild had been invited to display a selection of models in a marquee a short distance along the canal, and two smaller tents offered children’s painting activities plus membership applications & souvenirs offered by the Canal Society. Ten times life-size Meccano Nuts and Bolts, left over from the bridge construction, were on sale at £15 per fixing, or at a discounted rate of £8 if bought at the same time as a Society membership. Refreshments were available at a stall situated conveniently close to the Meccano display, thus allowing the hard-worked exhibitors easy access to warming cups of tea or coffee, supplemented by hearty flapjacks and a wide choice of attractive cupcakes. An encouraging number of people had gathered by the time John Nuttall and I arrived at about 11:00, and the crowd continued to swell until the opening ceremony. 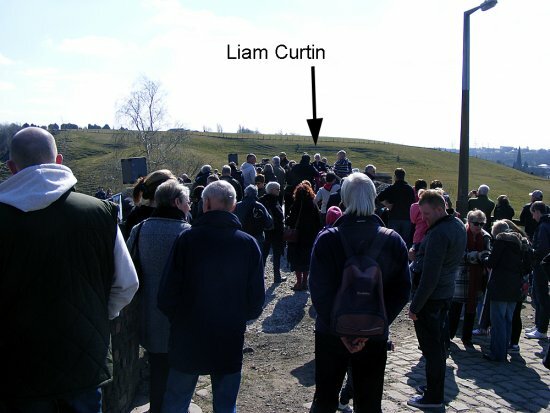 Liam Curtin, whose creative vision had made the bridge the unique attraction it is, welcomed everyone to the proceedings and paid a warm tribute to all those who had assisted in any way, with the project. Liam then mentioned that the date exactly coincided with the 60th wedding anniversary of local resident Mrs. May Barlow, who was also present. 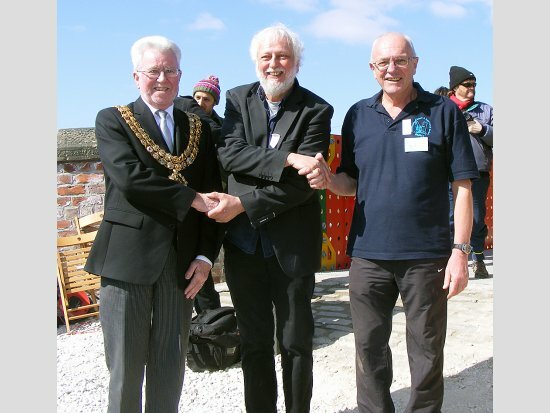 In recognition of this notable milestone a bouquet of roses was placed on the east parapet of the bridge; this gesture linking a diamond anniversary with the opening of a new asset to the community. Paul Hindle, the Chairman of the Manchester Bolton & Bury Canal Society, spoke next. Again recognition and thanks were given to all who had contributed to turning the vision into reality, and he made a special gesture in conferring life membership of the Canal Society on the surprised but very happy Liam Curtin. Finally, the tape was cut by the Lord Mayor of Bolton, Councillor Guy Harkin, using a specially-made pair of Meccano scissors. A respected and popular figure in the community, Mayor Harkin is well known for his work for Bolton Hospice, the Alzheimer’s Society and the Bolton Lads & Girls Club. With the completion of the ceremony the assembled spectators continued to take photographs and enjoy the significance of the event, walking across the full-size Meccano bridge in the cool but sunny early Spring weather. 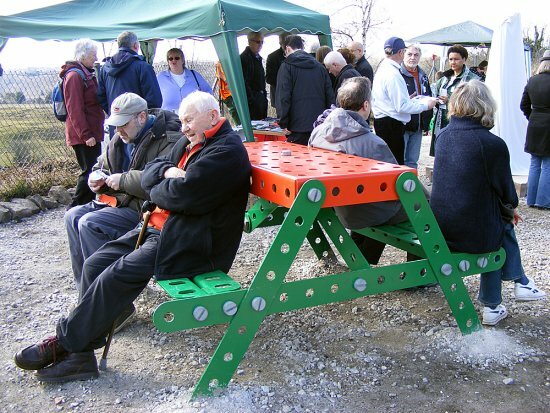 Those with rather less energy were able to sit at Meccano-style picnic tables with benches, two of which were situated with legs firmly embedded in concrete, on the south bank of the canal. Events taking place later in the afternoon included a local brass band, to bring to a close, a highly significant day in the history of the local area, the Manchester Bolton & Bury Canal Society, and the Meccano hobby.